Strawberry plants are an edible gardening gift that keeps on giving well beyond Valentine’s Day, according to a Texas A&M AgriLife Extension Service expert. David Rodriguez, AgriLife Extension horticulture specialist, San Antonio, said the new Texas Superstar selection – Festival Strawberry – provides some of the best characteristics on the market. The Festival Strawberry combines prolific production and quality taste as the latest Texas Superstar available for purchase in retail garden centers and nurseries, according to the Texas Superstar executive board. The strawberries are conically shaped and firm-fleshed with large, showy calyces. They are deep red on the outside and bright red inside. Typical yields are approximately 1.5 pounds per plant, Rodriguez said. The initial Texas Superstar promotion for Festival Strawberries in September came in time for fall planting through November, which experts say is the best time to plant the variety for springtime fruit production. But early February is also a good time to look for strawberries, Rodriguez said. “They won’t produce as well as those planted in the fall because the root systems aren’t as established, but Festival Strawberries are an unconventional but colorful and edible gardening gift idea for Valentine’s Day,” he said. Rodriguez said nurseries have good supplies of Festival Strawberry hanging baskets with fruit on them. Fruit will begin ripening in time for Valentine’s Day and produce through the end of May. Most garden centers and independent nurseries should have the hanging baskets available, Rodriguez said. Many have already been shipped, and they have been selling well. Rodriguez said plants can be left in hanging baskets or transplanted into 20-inch containers and allowed to cascade. Plants should be watered with low pressure and around the container’s lip to avoid washing out around their base. The main concern consumers should consider with Festival Strawberries that were not planted in the fall is cold sensitivity, Rodriguez said. “The plants themselves are very cold hardy, but whether they’re kept in the hanging basket or transplanted to a container, the developing fruit is cold sensitive, so plants should be moved to a protected area or covered when temperatures are going to dip below 25 degrees,” he said. 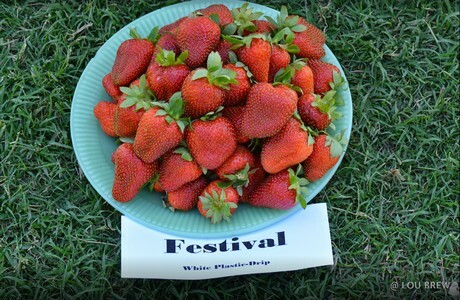 The Festival Strawberry variety was named a 2018 Texas Superstar plant by Texas A&M AgriLife Research, AgriLife Extension and Texas Tech University horticulturists after four years of field trials around the state. To be designated a Texas Superstar, a plant must be beautiful and perform well for consumers and growers throughout the state.